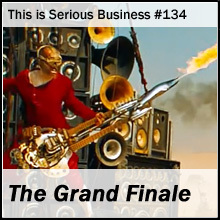 Well, it's been a long road, but all good things… Here it is, our last episode of This is Serious Business. 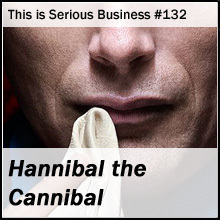 Christin and Rob go on a culinary adventure through NBC’s Hannibal. The results? Delicious. 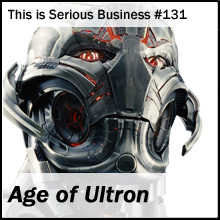 After bombarding ourselves with Avengers: Age of Ultron, the G1 panel decides whether or not it was worth it. TiSB returns! 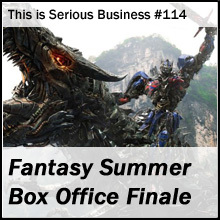 We draft lineups for Fantasy Summer Box Office, 2015 edition. Who will score the Avengers? Who will snag John Green’s next book turned movie? Is that a baby in the background!? Find out! Rob and Christin venture into Middle Earth one last time, god willing. Luckily, the final chapter in a trilogy based on a very short children’s book almost makes the whole venture worthwhile. 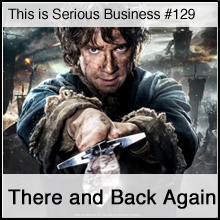 Audio Credits: This episode features audio excerpts from Murmurs of Middle Earth by Pogo. 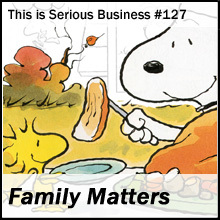 Happy Thanksgiving from TiSB! This week Jon and Michelle have a special announcement! Plus Christin reviews Mockingjay: Part I and we share some cherished family memories. 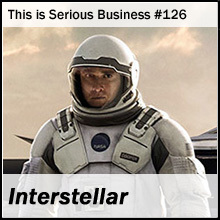 We’re joined by guest-panelist Laurie as we check out the Nolan brothers’ new intergalactic trip, Interstellar. Team Rocket’s blasting off againnnnn. A combination of a Ferret and a Bat? What about a snake and a Rhinoceros? Why not? 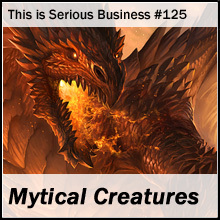 We talk our favorite Mythical creatures and how we like to see them portrayed in modern media. 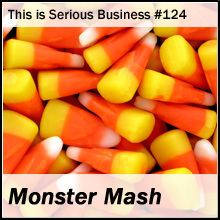 Our Halloween week continues with a discussion of classic monsters, including the novels for Frankenstein and Dracula. Plus, we take a detailed look at Avengers: Age of Ultron’s first teaser. 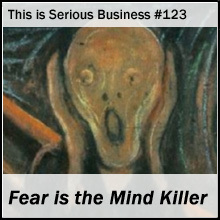 Things get spooky as we discuss our fears, horror movies good and bad (especially ones featuring Johnny Depp), and Christin’s idea for a Sleepy Hollow episode. 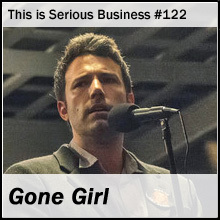 A dynamic duo talks Gone Girl and how some things might be better if people were literal demons. 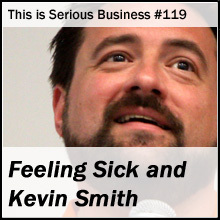 A plucky panel (including a sick Jeff) teams up to discuss Kevin Smith’s storied career, including his latest project: Tusk. 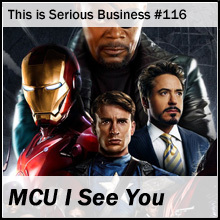 We go back to our roots with a retrospective on “Phase Two” of the Marvel Cinematic Universe, plus our take on the upcoming Avengers: Age of Ultron. 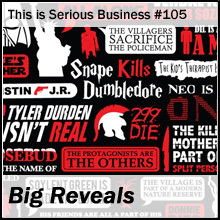 TiSB #114: Fantasy Summer Box Office Finale! A victor emerges in our closest Fantasy Summer Box Office game ever! There were many surprises, including Guardians of the Galaxy, Godzilla, and the massive bombing of Expendables 3. 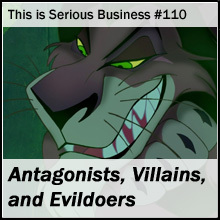 An iron three panel takes on the broad subject of what makes for a good villain, rival, or antagonist. Then we check in on the latest Fantasy Summer Box Office happenings. 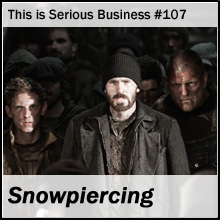 Christin and Rob talk Snowpiercer, and how it may be the best action movie they’ve seen in years. Plus, it’s got Tilda Swinton, guys! 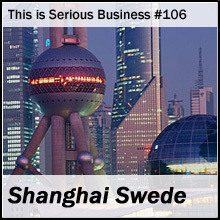 Marcus returns and talks about barely surviving Shanghai. We learn about Chinese culture, media, and hospitals. A plucky panel discusses some of the biggest reveals in TV and cinematic history, plus rants about How I Met Your Mother. Beware, here there be spoilers (mostly stuff you already know).